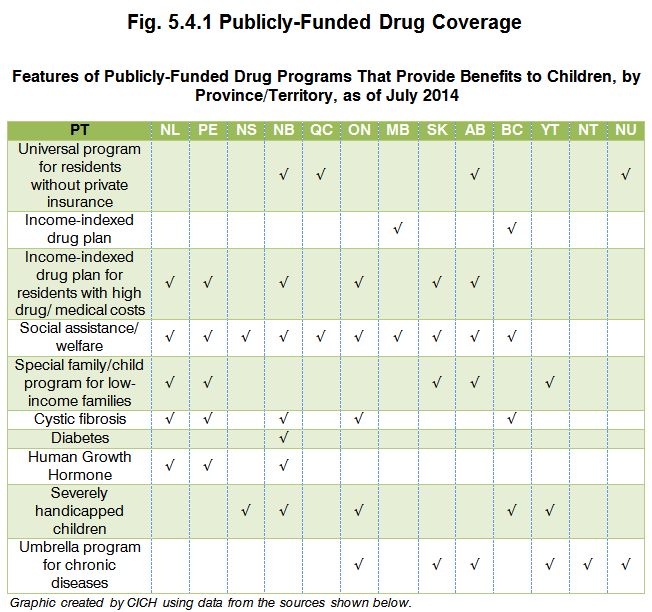 Approximately 85% to 90% of children have access to drug benefits through parents’ employment benefits rather than the public healthcare system.2 Québec, Alberta, New Brunswick and Nunavut are the only providers of universal drug coverage for all residents.3 Saskatchewan provides coverage for drugs listed on the Saskatchewan Formulary for all youth under the age of 14. Other provinces have public plans that extend to low-income families or families of children with chronic conditions such as cystic fibrosis (Newfoundland & Labrador, Prince Edward Island, New Brunswick, Ontario, and British Columbia); diabetes (Prince Edward Island and New Brunswick); those needing human growth hormone (Newfoundland & Labrador, Prince Edward Island and New Brunswick); and those with severe disabilities (Nova Scotia, New Brunswick, Ontario, British Columbia and the Yukon). Other provinces/territories have umbrella programs for a number of chronic conditions (Ontario, Saskatchewan, Alberta, the Yukon, Northwest Territories and Nunavut). Click here to see more information about the publicly-funded drug programs that provide benefits to children, by province and territory. 1Ungar, WJ & Witkos, M. Public drug plan coverage for children across Canada: A portrait of too many colours. Healthcare policy. 2005; 1(1):100-22. 3Announcements have been made for increased coverage in New Brunswick. (April 2015). Click here to see the sources used to create the table above. In Canada prescription drug coverage is financed through both privately and publicly administered insurance plans. Each province/territory allocates its own healthcare budget, and public drug coverage is not universal in many parts of the country. Decisions about coverage are made on a number of factors – age, poverty and unemployment1 – as well as drug spending thresholds and public health implications related to the treatment of communicable diseases.